1:05 p.m. Fedde (0-0, 0.00) vs.
7:00 p.m. J. Rodriguez (0-1, 5.06) vs.
7:00 p.m. Mapes (0-0, 1.80) vs.
6:05 p.m. Alastre (0-0, 2.25) vs.
Adrian Sanchez’s fourth hit on the night turned the tide for good as Syracuse defeated Norfolk 9-8 in 10 innings for its fourth straight win. Tommy Milone got the start but was ineffective, giving up five runs on six hits and a walk over five innings. The win went to Carlos Torres as he pitched two scoreless to finish the game. 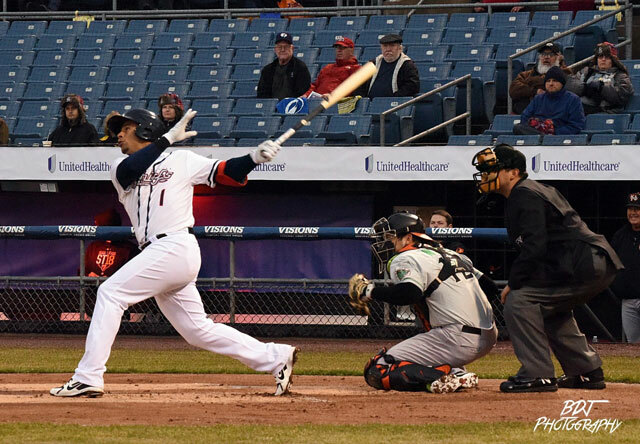 Sanchez singled twice and doubled twice while Alejandro De Aza reached base three times as did Chris Dominguez with a triple and a homer. Roster move: OF Rafael Bautista reassigned from Harrisburg. Ah, the joys of early-season scheduling. Harrisburg and Bowie rematch for three over the weekend before before Reading comes to town Monday through Thursday for the Sens’ first homestand. Roster move: OF Hunter Jones reassigned from Syracuse. Joan Baez loaded the bases in the 3rd but rolled a double play to get out of it. Unfortunately, that only kept the deficit at 6-0 as the Keys pounded the P-Nats 11-6 in the series opener. Baez did not issue a walk for the first time since August 2, 2016 but did give up eight hits and hit a batter while suffering the loss. Potomac squeezed six runs out of just eight hits and three walks, led by Jake Noll (double, HR, 3RBI) and Edwin Lora (two singles, RBI). Roster moves: 1B-OF Ian Sagdal placed on the 7-Day; IF David Masters activated from the 7-Day DL..
Hagerstown led Greensboro 5-0 after two, and 7-3 after four, and 9-7 after seven, but couldn’t hold on for 10-9 loss in 10 innings. Jackson Tetrault piled up eight K’s but also gave up eight hits, including a home run and four runs total after five for the no-decision. A.J. Bogucki (2R, 2IP) and Jared Brasher (3R, 2IP) brought the gas instead of the water to put out the fire, but the loss went to Max Engelbrekt who let in the runner placed on 2nd in the 10th on a one-out single. Luis Garcia led the Suns 13-hit parade with four singles, followed by Alejandro Flores’s 3-for-5 night. Wow — 17, 17, and 19 runs in the games reviewed. Nat pitching allowed 30 runs across three contests. Um . . . not much good to say about that. Baez is repeating A+ at age 23 and getting clobbered. We’ve heard for at least three years that he’s one of the great arms in the system. It’s time to start proving it. Looks like the word is out on Soto, as they walked him three times, although he also managed a double and two RBIs. Good to see Garcia starting to make some contact. Let’s hope his buddy Antuna joins the partty soon. Good to see Nick Banks showing some life as well. Thinking the Nats may be forced to move Soto up the chain just so that he can see strikes. Not going to help his development if the Sally League foes are going to pitch around him every game. Previous night it was his second double. It was a triple. Soto also scored 2 with 2 RBI. Carter Kieboom is off to a slow start, both at the plate and in the field (3 E in 8 G). You have to wonder whether they’ll move Kieboom off SS at some point just to ease the fielding pressure on him. Same with Antuna. They’ve got Turner for a long time at the MLB level so don’t need a SS. Murphy is likely leaving after 2018, and Rendon could leave after 2019, so 2B and 3B are the positions of more immediate need. Turner ought to be at 2nd base or the outfield much like Desmond. They have Luis Garcia with a left-handed bat who could play SS as well. The glove at shortstop is Jose Sanchez. I am hoping the Lerners go wild and sign Machado plus Harper … you never know? There’s no reason to move Turner off SS. He’s basically league-average defensively. The only reason to move him off SS would be to get a defensive stud into the lineup, and I don’t see one of those on the horizon. The Nats have very little need to spend for Machado (other than to screw with Angelos). I’m still questioning whether they have the “need” to spend for Harper. Also, the guys we’re discussing are years away. At best, Kieboom is probably two years from the majors, unless he really finds his mojo at Potomac and ends the season with a successful campaign in AZ. Even with them being pushed so rapidly, I still say Antuna and Garcia are three years away. It’s possible they could max out everything and come up in two, but it’s more likely to be three or four. In four years, Turner will be in his last season of team control. Robles is one of the best prospects in baseball, but even he spent a year between Hags and Potomac, another between Potomac and Harrisburg, and likely at least another half a year at AAA. Barring injury, Turner will be the Nats SS for many more years. Rizzo is 100% committed to him at SS. Kieboom needs a fully healthy season to assess him as both a SS and what type of MLB prospect he really is. His start at H’town last year promising, but he ended up with only 179 at bats at that level. FWIW, errors are not a very relevant metric to judge a players defensive ability at the low minor league levels. Guess that the Nats want Kieboom to play SS for as long as possible until there is no doubt that he must find a home at another position. The only sure thing looks to be Soto … we still don’t know if Robles could handle AAA pitching well enough to generate a high OBP leading off. Soto is the superior bat over Robles on that I think most scouts will concur. If Soto rakes in Hbg, then continues in Potomac, then begins demolishing the AA Eastern League? Soto has 3 home runs, 2 triples, 2 doubles 6 K’s against 9 walks with pitchers preferring to walk him rather than give him a pitch to hit? 1.455 OPS. Already this soon. Its not like he wasn’t doing as well before his injuries last season?